A magnificent imitation wood, available from stock in Belgium, in 4 shapes in 12 wood colors each - meaning 48 new items! Shapes can be stacked to create the most beautiful frames. Check out our updated catalog. Don't forget to visit us at booth E44 @ FamaArt 2018. Our team will be there to show you our new items. Our BARNWOOD Collection is available from stock in Belgium. The worn-out look of this collection imitates the wood from old barns and cottages - wood that suffered the influence of sun, wind and rain. Our collection combines that old look with a quality of wood perfectly suitable for picture framing. From 3 to 5 March, you will find us at Europe's most important trade show for the picture framing business: FamaArt 2017 in Bologna. Visit us at booth E58. During the first 6 weeks of the summer we will offer a special "Summer Deal". 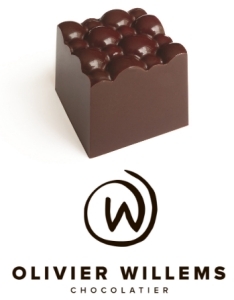 Send us your order and receive a free box of Belgian Chocolates - handmade by a local chef (Olivier Willems). This promotion is applied on all orders of stock items, shipped between 1st of July and 13th of August, 2016. We had a very succesful show @ FamaArt Bologna 2016. The presentation of our new Davide Sartori Collection and the framed pictures of Fontana Sura surprised many existing customers and attracted new distributors from all over Europe. Did you miss the show? Don't wait any longer and contact us today to get more information regarding the 80 new items we added to our European collection. Designed in Italy by one of the world's most famous designers of picture frame mouldings - exclusively for our mother company EC Moulding Malaysia. Already available in 3 series: Materia, Venezia and Otto. In total 80 different items - available from stock in Belgium - minimum order quantity only 1 box per item. Download our new catalog to see all the items we recently added. We will have a booth at FamaArt 2016 in Bologna. Make sure you visit us, as we will introduce a complete new collection - over 80 new items - all available from stock in Belgium! Our updated catalogue is now online. Two new series have been added to our Belgian collection: Bologna (large ornate in 3 hand finishes) and Helsinki (imitation wood tones, matching contemporary furniture finishes). As usual, these items are availble from stock, shipped within 48h from Belgium and only small minimum order quantities ! 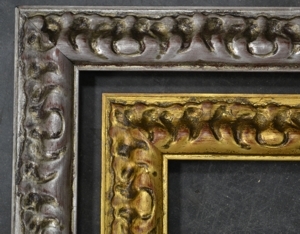 EC Mouldings will participate at the new international framing show: FamaArt. The show will be held in Bologna from 6 till 8 March 2015. The EC Mouldings team will be joined by our Malaysian partners to welcome you on our booth. 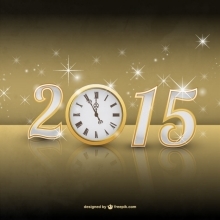 To support our loyal distributors/customers, we will maintain the pricing of 2014 one more year. No price increase from EC Mouldings! 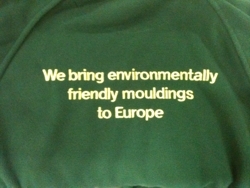 Please time a moment to have a look at the company presentation of the EC Moulding International. Now available from stock - in small box quantities as usual. 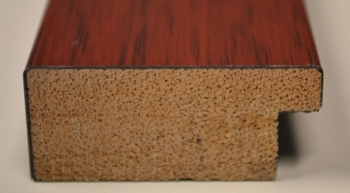 The vertical part is only 5mm wide. This means it fits perfectly well underneath any other moulding to stack them (see sample). 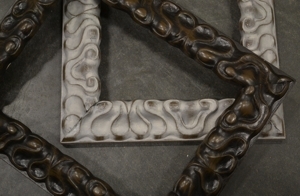 Or you can use them as a very narrow L-shape moulding for contemporary art. We are proud to announce that the improved version of our Faux-Ramin Series is available. We can now offer 5 shapes in 6 colors - all in GESSO-FREE. This means there is no more gesso between the fingerjoint durian wood and the finishing foil. Both choppers and saws can easily cut the Faux Ramin Series now. Do you want some samples to see the cutting results on your own equipment? 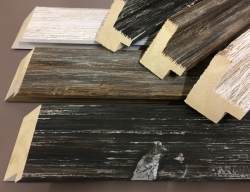 Just send a brief email to kris@ecmouldings.eu and we will make sure you get some samples soon. Don't forget to visit us at the FrameArt Expo in Milan - March 22nd - 24th. Same place as 2011. You can find us on booth B52-54. 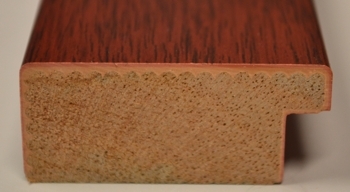 We will show you plenty of new finishing techniques we can offer. Click here for more info and to pre-register. In many countries, traditional choppers (guillotines) are still widely used by picture framers. 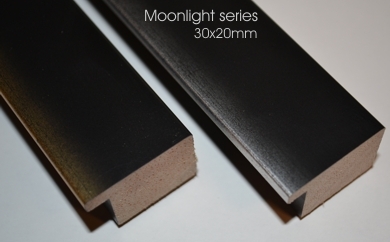 In our collection, we have a big range of gesso-free mouldings, 100% suitable to cut with both saws or guillotines. Look for the "gesso-free" logo that points them out. The Chicago series are available from stock. This series is ideal for contemporary art and photoframes. Black or grey on the inside and 4 different metallic colors on top & back. Following requests from many customers, we produced this series "gesso-free", using the latest techniques available. More new items have arrived. 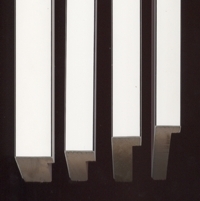 First we have 6 items in matt white - the same shapes we have in matt black. Our customers have been asking for them... now they are available from stock in Europe! 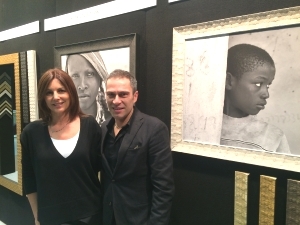 Please stop by our booth at Frameart Expo in Rome. You can find us in Hall 14 - booth B26-28. A large number of new items will be at display. E-Wood Moulding invested in a brandnew production line. Not just an extra line to increase capacity. No - a totally new line, creating new possibilities. 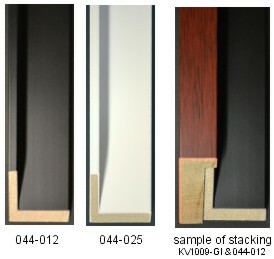 So far E-Wood Moulding and EC Mouldings concentrated on high-volume mouldings. The day-to-day items that every distributor and every framer in the world needs. A typical sample are the blacks and the faux-ramin. Sometimes we made them fancier like the Simoncello & Moonlight as alternatives to the traditional blacks. Don't forget to put the FrameArt Expo 2012 in your agenda: from March 30th till April 1st 2012. The location for 2012 will be Rome, joining the Photoshow. At the FrameArt Expo you will find us on stand C53. The EC Mouldings team will be waiting for you: Keith & Kris and our Malaysian partners Calvin, Chai and Goh from the production facility at E-Wood Moulding. You can now pre-register for the show, so you don't have to wait at the entrance. EC Mouldings will exhibit at FrameArt Expo 2011 in Milano (Italy). The FrameArt Expo is the new international picture framing show, where you will meet manufacturers and suppliers from all over the world. The show runs simultaneously with PhotoShow 2011 - the most important annual exhibition for photo and digital imaging in Italy. More informaton on FrameArt Expo can be found on this website: www.frameartexpo.com . Some customers ask us a recommendation for a hotel. We found & booked this one for ourselves: Hotel Nasco at walking distance from the show. Their website is www.hotelnasco.it. 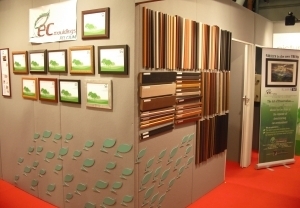 At SACA 2010 we showed you a wide range of the products made upon request for customers of E-Wood moulding and that can be offered to you as "special production" items. 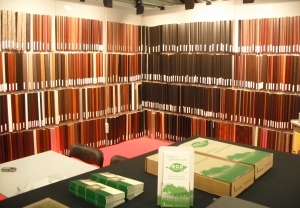 Now these mouldings can be seen in our showroom in Oostende (Belgium). Do you want to visit us at the Belgian coast? Please contact Kris to fix an appointment! EC Mouldings now runs on 100% green electricity! Our sister company Cami added another 159 solar panels to the installation of last year. 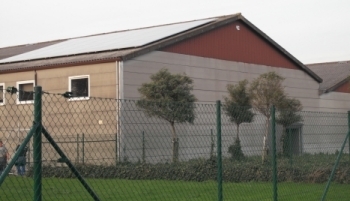 We now have 208 solar panels on the roof of the Cami/EC Mouldings warehouse - producing 50.000 KWh per year. This is more than we need to run our warehouse. At EC Mouldings - we care for nature ! Our new items (Simoncello white & alu look) are moving very fast. Following this success, we will have an addition in the same range soon. It will be available by November 2010. Keith will be visiting Photokina (Köln - Germany) and the Art Fair Europe (Nüremberg - Germany) next month. If you want an appointment, please call him: +44 1625 574806 (office) or +44 777 5604630 (mobile). 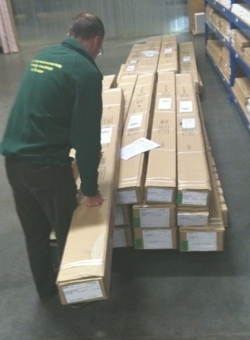 Some of our customers ask if our environmentally friendly mouldings have the "FSC" label. Well… they don't! But this does not mean our mouldings not eco-friendly - on the contrary! It's a widespread misunderstanding that people think that FSC means environmentally friendly. No! FSC refers to the origin of the wood. FSC wood comes from sustainable forests. This label has no extra information regarding the additional manufacturing process and materials involved in producing the moulding … Our mouldings are made on durian wood, harvested from the durian orchards after their fruit harvesting period is over and going for replanting process. Our partner E-Wood Moulding has obtained a statement from the Malaysian Timber Certification Council to proof the origin of the wood are indeed from the orchard plantation..
We also care about the way our wood is transfered into the mouldings we offer. First of all we don't use solvent-based paints any more, as they are very unfriendly for nature. We only use water-based paints.E-Wood Moulding is also working very hard with their suppliers of foils to get eco-friendly supplies. Although we don't have the FSC label, our products surpass it ! !…Please feel free to contact us for more information regarding this issue. Our philosophy is not a commercial strategy - it's our mission ! Two new series arrived: alu look and Simoncello white. Please have a look: alu look / Simoncello white. Following the request of some of our distributors, the new items and the new production of existing items will be packed in smaller boxes. This gives our our customers some extra advantages: boxes are lighter, easier to handle and there is a smaller minimum quantity. 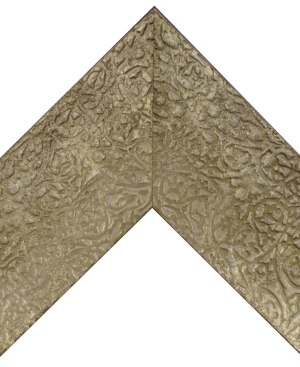 A few more weeks and we will present you our new collection 2010. These items will arrive mid June. We would like to thank all our customers and prospects for visiting us at Quadrum/SACA 2010. EC Mouldings and our partner E-Wood Moulding will exhibit at the Quadrum/SACA 2010 show in Bologna. The show will take part from Thursday 18th till Sunday 21st of February 2010. We welcome you to our stand (hall 26 - stand C17), where we can show you the full EC Mouldings collection, the new prototypes for 2010 and a major part of the E-Wood collection. EC Mouldings and Cami made a series of 100 photo frames 15x20cm in environmentally friendly mouldings.These frames will be sold door-to-door at 10 EUR/pc. The total amount will be donated to the "Haiti Lavi 1212" fund raising for the victims of the earthquake in Haiti in the beginning of this year. The target is to raise at least 1000 EUR. We will keep you informed of the final result. At EC Mouldings we try to support nature as much as we can. That's the reason why one of the EC Mouldings partners (Cami) invested in solar panels - 49 pcs supplying us 10.000 KWh per year. Now over 30% of the annual power we use in our warehouse comes from green energy. This fits well with our environmentally friendly mouldings. At EC Mouldings - we care for nature! To answer some of the most frequent questions, Keith made a short film along with a picture framer. Please have a look at YouTube to get the answers to some of your questions or remarks regarding our environmentally friendly mouldings. The latest new series are available right now: crosshatch and the small metallic. "ec" will become the brandname of our environmentally friendly mouldings. You will notice that the EC logo will appear on all our marketing tools and on our packing material. Detailed information on the EC brandname and the 3 different series (H2O, Orchard and Natura) is available here. Two of the new series are available right now: Simoncello and the shadowbox faux-ramin. An updated version of our EC Mouldings catalog is now online. It contains 4 new series that will be available from the beginning of April (shadowbox faux-ramin and simoncello) or from the beginning of May (small metallics & crosshatch). 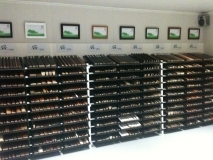 Our partner E-Wood Moulding is constantly improving their production process. This way they stay ahead of competition - especially on new techniques. Thanks to this strategy EC Mouldings can offer you state-of-the-art environmentally friendly mouldings. Please take your time to download and read this presentation of E-Wood Moulding (PPS-file - 16Mb - 5 to 10' download time). You can now download the EC Mouldings catalog from our website. Our first container will arrive on the 12th of September. This will be the official start of EC Mouldings.